Amish Furniture Factory carries wooden benches for sale for any occasion. Browse our bench category and find Amish benches for the dining room, entryway, kitchen, and porch and patio. For the dining room, we recommend either a flat bench with no seat back, or our seat back benches which are essentially widened dining room chairs. The seat back benches are an excellent alternative to dining room chairs that might typically be placed on the long side of a table. Check your table dimensions before ordering a bench to ensure proper fit. Our flat benches, such as the Fraser, or Manitoba bench are also excellent choices to have in a dining room for the long-side of a dining table. The Fraser and Manitoba benches can be ordered at custom lengths from 48” to 96” which makes them versatile in fitting many sized tables or areas. The other benefit of the flat benches is their ability to easily store in an entry area or hallway since they can fit flush against a wall or in a corner. Our larger wooden benches for sale are available in oak, cherry, brown maple, maple, rustic cherry, and ¼ sawn white oak. Each wood type can be stained with a variety of stain colors leaving many options available for your to customize your bench in you desired wood type and color. We can also have your bench painted in nearly any color imaginable. Contact us if you need help selecting you finish color, or can’t find the color you’re looking for. Our Amish outdoor porch and patio benches are the best quality imaginable. 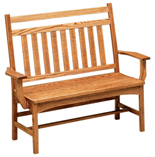 We offer our outdoor Amish benches in solid yellow pine, cypress wood, or poly wood. The materials of our wooden benches for sale are well suited for outdoor use as yellow pine and cypress have a natural ability to resist weathering and wood rot. Our poly wood, or poly vinyl benches are made from a high density plastic (Poly Vinylethylene) derived from post-consumer bottle waste such as milk containers.